FANBOY PLANET.com . : mc-heruniverseeverydaycosplay :. Everyday Cosplay with Ashley Eckstein's "Her Universe"
Perfect for everyday wear. .
She fights fiercely in The Clone Wars, waiting for the inevitable betrayal of Anakin Skywalker. But that's a long time ago in a galaxy far, far away. We're more concerned about Halloween 2012... and beyond. 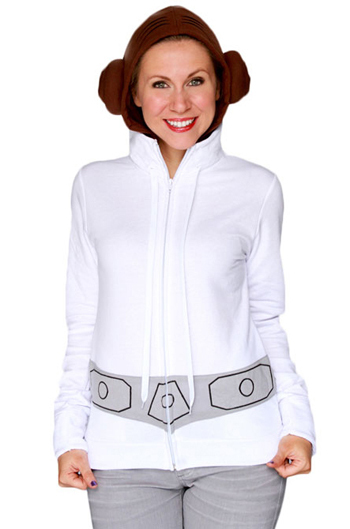 So Ashley Eckstein, voice of Ahsoka Tano and founder of Her Universe, has just revealed a line of products that I think we won't just see at Halloween parties this year. They'll be at fashionable conventions everywhere for years to come. "I have a tub full of Halloween costumes that I have spent a lot of money on which I've only worn once," said Eckstein. "My goal for our ‘everyday cosplay' line is for girls to be able to wear these fashionable costumed looks on Halloween and all year round! I've always been a savvy shopper and I try to get the most for my money." Her Universe (tm) launched in 2009, in conjunction with The Araca Group. Eckstein has licensing deals with Lucasfilm, BBC-America and CBS, so everything here is official... and really cool. Her "everyday cosplay" line has been bubbling for a couple of years, but these additions really have us sold at Fanboy Planet. 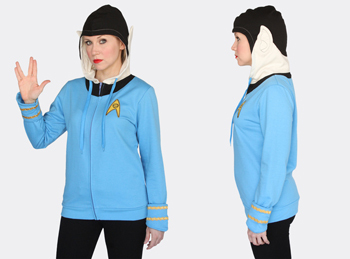 but it's also obvious that this is a really cool dress. .
New to the "everyday cosplay" line from Her Universe is the Star Trek Spock zip-up hoodie featuring the famous original series blue uniform top where fangirls, with the hood up, can be their favorite Vulcan, complete with pointy ears. 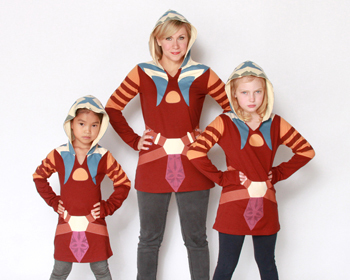 Also new this fall season is the Star Wars: The Clone Wars Ahsoka Tano adult tunic top which complements the already released Ahsoka tunic for young girls and the very popular Princess Leia costume hoodie - perfect for any Halloween party or everyday wear. 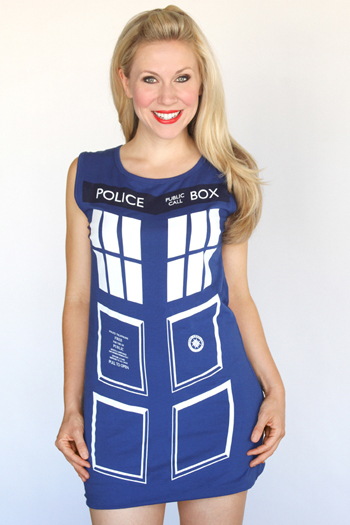 For female Whovians, Eckstein has collaborated with retailer Hot Topic to create Her Universe's first fashionably-fun, stylized dress based on Doctor Who's beloved time-traveling TARDIS - available online NOW at Hot Topic and at Hot Topic retail stores. 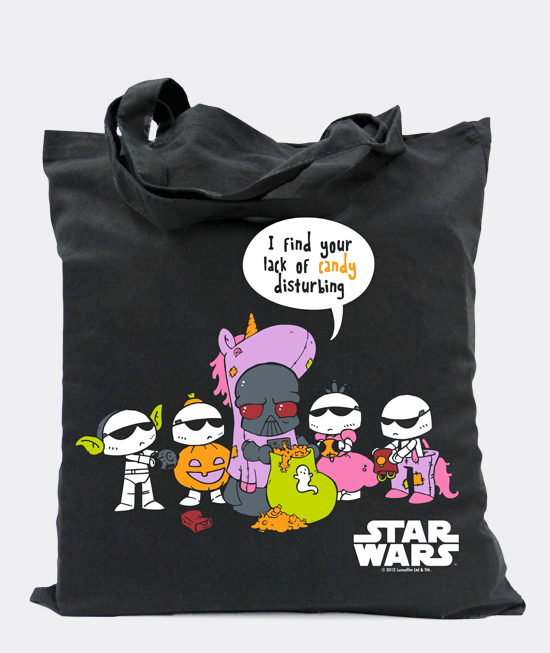 And what better way to accessorize all of these pieces than with the new Her Universe Star Wars Halloween Tote Bag featuring all-new original art by renowned artist Katie Cook - perfect for fans of any age for school, work, shopping and, of course, trick or treating! Katie's very popular Her Universe Halloween Tote Bag sold out last year at record speed! The bags are only available for a limited time. "I was thrilled when Ashley asked me to do another Halloween bag design," said Katie. "I'll take any chance I get to draw Darth Vader in a silly costume! Ashley and I came up with the idea for this year's bag at Celebration a few weeks ago and I couldn't wait to come home and get started on it." Should I buy this for my daughter? She would sooner kiss a wookie. May Her Universe live long and prosper..